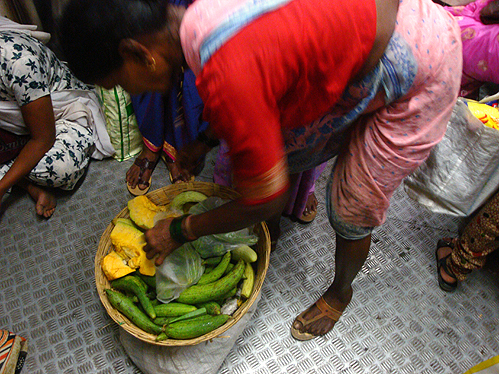 All kinds of stuff gets sold on local Bombay trains, especially in the women's compartments: vegetables, fruits, safety pins, cell phone covers, earrings, rings, bangles, sarees, stationary, dress material, make-up, evening snacks, you name it. What caught my eye this time was the last of the vegetable stock being sold off late in the evening - past 9pm. Within a few minutes everything is gone, because almost every woman in the compartment has to go home and cook for the family.